Earlier this year, I reviewed LILY OF THE NILE by Stephanie Dray. While I was a bit concerned about whether I would appreciate this novel since I so loved Michelle Moran's CLEOPATRA'S DAUGHTER (my review), I was happy to discover that LILY OF THE NILE was terrific. After completing the novel, I was very excited because it was the first book in a trilogy; and I was anxious to see what life had in store for Selene. So when I received a copy of SONG OF THE NILE, I had pretty high expectations. I thought Ms. Dray brought a very unique perspective to Selene's story and I also appreciated her writing style. In addition, I was blown away by the amount of research she did on not only Selene, but also all things ancient Rome. And while SONG OF THE NILE still encompassed these things, I just wasn't as taken with the story as I was with LILY OF THE NILE. Maybe it's my mood this week (because goodness knows it's been a rough week for us Penn Staters), but it took me almost a third of the book to really get into the story. I just felt as if some of the sections were a bit too detailed and I found myself losing interest here and there. And I did have some issues with my ability to "like" Selene. However, there were many very good things about this book as I mentioned earlier. I have a great deal of respect for Ms. Dray and her storytelling abilities. There is absolutely no doubt that she's thoroughly researched her story, and she managed to create some very interesting scenarios. While there isn't a huge amount of historical information available on Selene, Ms. Dray did a remarkable job of incorporating the facts and fiction to make a compelling story. Another extremely compelling aspect to SONG OF THE NILE is the character of Selene. She is definitely her mother's daughter and exhibits many of the same traits that made Cleopatra such a memorable figure. I admit that I did have some difficulties relating to her for much of the novel, but I did have to admire her tenacity about assuming the title as Queen of Egypt. Because this book did cover a few years in her adulthood -- years where she was newly married, shipped to another country, and a mother, Selene did manage to mature a great deal by the end of this novel. While I'm still not certain that I absolutely loved her, I liked the direction her character took and I understood her actions. 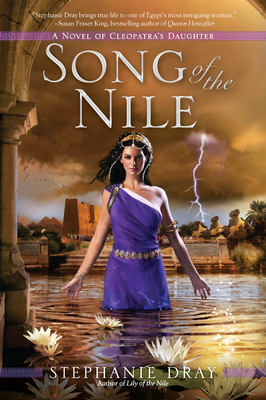 SONG OF THE NILE would make for an interesting book club discussion, especially if your club enjoys historical fiction. Personally, I'm not so sure it would work for my group because the story includes some "supernatural" elements and we have a few members that would have a hard time getting past that! However, Selene is a complex and interesting character, and as a result, she definitely could generate a great deal of discussion. In addition, there are some other interesting topics including the symbolism in the novel, the role of women in society, the culture of ancient Rome, different religions, family, love, obligation, duty, and much more. There is a wonderful reading guide in the back of the book --with 30 questions. The questions are even divided into the story and the history, culture, and religion aspects of the novel. It truly is one of the most thorough discussion guides that I've come across. Having said that, I wasn't able to find an on-line link anywhere. While SONG OF THE NILE didn't exactly live up to my high (any maybe unfair) expectations, I did enjoy the novel. I am looking forward to Ms. Dray's next book in the life of Selena. Thanks to the author for providing a copy of this novel. Not every book can be wonderful, but I'm happy to know that this one has merit despite not living up to your high expectations. I'm reading this book right now and am enjoying it. Selene is a bit harder to like in this book, but with all she's gone through, it's understandable. It's too soon for me to say whether I like Lily of the Nile more, though. Yes I don't know how you all can think of anything else this week! This actually sounds like a book my book club would like - most of them are historical fiction nuts. I am glad that you enjoyed this one...I've heard great things about this trilogy! Hi, Julie, Came over from Bermudaonion. I liked very much your taking the time to give this comprehensive review on this book. It's good when we can honestly say we aren't always 100% behind a book because of personal preference. I think it's good for our viewers. Good for you!